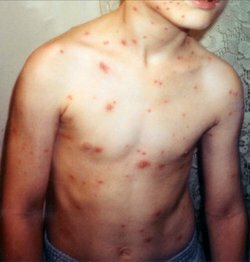 Chickenpox is caused by the varicella-zoster virus (VZV), also known as human herpes virus 3 (HHV-3), one of the eight herpes viruses known to affect humans. It is characterized by a fever, followed by itchy raw pox or open sores which heal without scarring. Chickenpox has a two-week incubation period and is highly contagious by air transmission two days before symptoms appear. Therefore, chickenpox spreads quickly through schools and other places of close contact. Once someone has been infected with the disease, they usually develop protective immunity for life, and cannot get it again. As the disease is more severe if contracted by an adult, parents have been known to ensure their children become infected before adulthood. The disease is rarely fatal: if it is involved in a fatality, the actual death is usually from opportunistic varicella pneumonia, and occurs more frequently in pregnant women. In the US, 55 percent of chickenpox deaths were in the over-20 age group, which is indeed at risk from the virus. Doctors advise pregnant women who come into contact with chickenpox should contact their doctor immediately, as the virus can cause serious problems for the foetus. Later in life, viruses remaining in the nerves can develop into the painful disease, shingles, particularly in people with compromised immune systems, such as the elderly, and perhaps even those suffering sunburn. Some of these will develop zoster-associated pain or post-herpetic neuralgia, described usually as horrible or "excruciating". A chickenpox vaccine has been available since 1995, and is now required in some countries for children to be admitted into elementary school. In addition, effective medications (e.g., acyclovir) are available to treat chickenpox in healthy and immunocompromised persons. Symptomatic treatment: calamine lotion to ease itching and paracetamol to reduce fever, is widely used. It is contraindicated to use aspirin in children with chickenpox, as it can lead to Reye's syndrome. One history of medicine book claims Giovanni Filippo (1510â€“1580) of Palermo gave the first description of varicella (chickenpox). Subsequently in the 1600s, an English physician named Richard Morton described what he thought was a mild form of smallpox as "chicken pox." Later, in 1767, a physician named William Heberden, also from England, was the first physician to clearly demonstrate that chickenpox was different from smallpox. However, it is believed the name chickenpox was commonly used in earlier centuries before doctors identified the disease. the term reflects a corruption of the Old English word, "giccin", which meant "itching"
New research suggests that the US government has unwittingly traded a typically mild childhood disease for a far more serious illness that affects adults. Should the varicella vaccine be given to all children to prevent chickenpox? The standard treatment for a child with chickenpox is aimed at lessening the itching. The disease has to run its course and nothing shortens its duration. Many parents believe chickenpox is a harmless childhood disease. For the most part they are right. But it can have serious consequences for some children.